Bryce Hayes took home the Grand Champion Gilt Award for his 264-pound hog. Showing a grand champion is the goal for most people who enter the show ring. 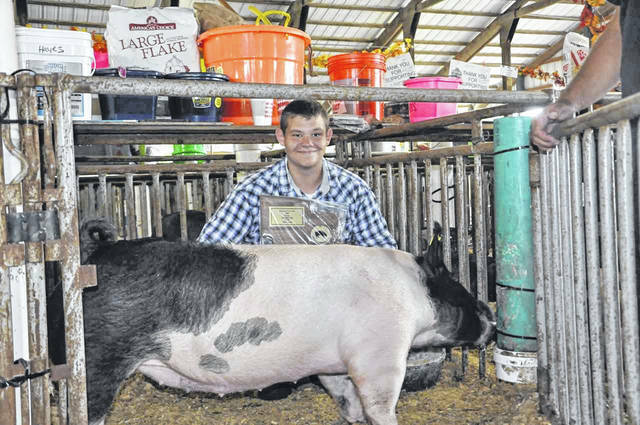 During Monday’s 2018 Delaware County Fair Pig Show, Bryce Hayes reached that goal, taking home the Grand Champion Market Gilt Award. Hayes, a resident of Marengo in Morrow County, was awarded the prized honor for his 264-pound middleweight gilt, which beat out nearly 30 other gilts to win the Middleweight Division earlier in the day. Hayes’ hog then edged out the champions of the Lightweight and Heavyweight divisions to take home the top honor. He added responsibility and working consistently with the animal are critical to having a grand champion, saying showing is a full-time responsibility if the hope is to win awards. Recent Elgin High School graduate Lauren VanGundy, who was announced as the 2018 Delaware County Junior Fair Queen on Saturday, wrapped up a 10-year showing career at the Delaware County Fair by being named the Reserve Grand Champion for her 270-pound gilt. Brooklin Davis took home the Champion Lightweight Gilt Award, with Jack Nebraska winning the Reserve Lightweight Gilt Champion Award. Kase Tidd, who showed the Grand Champion Barrow, took home top honors in the Heavyweight Gilt Division, followed by Maggie Cain. Winners of their individual class in the Gilt Division were Davis (Lightweight Class 1), Nebraska (Lightweight Class 2), Kason Kaelber (Lightweight Class 3), Sylvia Fulks (Lightweight Class 4), Kylee Kaelber (Middleweight Class 1), Lilly Henney (Middleweight Class 2), Brooklin Davis (Middleweight Class 3), Hayes (Middleweight Class 4), VanGundy (Middleweight Class 5), Tidd (Heavyweight Class 1) and Cain (Heavyweight Class 2).